When I am studying esoteric systems, I always ask why things are the way they presented. I question even established doctrines. When you take everything for granted, you often miss the point. 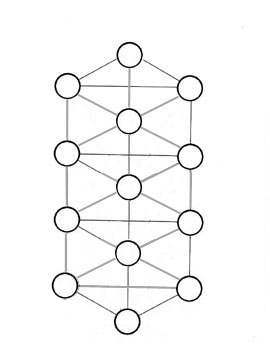 The following flowed forth naturally when I studied the Tree of Life, because not only are there differences between kabbalists on certain issues, but also certain explanations don’t seem to make sense, at least to me. I think the traditional Tree of Life is incomplete because there are Sephiroth and paths missing, which when added makes all the other things come into place. In the following I will explain why I feel the need for a corrected Tree of Life and why I think this is a better representation of the whole system, without invalidating the traditional Tree of Life. It is all about symmetry and geometry. The traditional paths are not that logical to me. 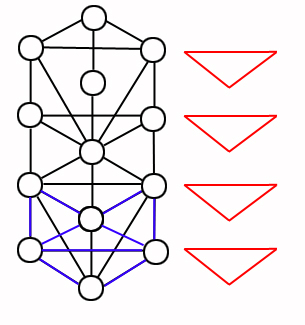 Why are Binah and Chohmah connected with Tiphereth, and Hod and Nezach with Malkuth, but Chesed and Geburah are not connected with Yesod? Also, and more important, one Sephiroth flows forth from another in a well defined order when going down the Tree. First we have Kether, then Chochmah, then Binah, then Chesed and so on. 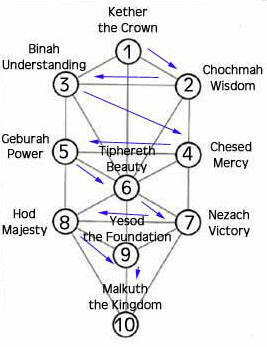 Although Chesed flows forth from Binah the Tree of Life (as shown by the kabbalists) never shows a path between those two Sephirah. Because Chesed flows forth from Binah there must be a path. Even when Daath is taken into consideration there must be a path between Binah and Daath and between Daath and Chesed. Let’s start with what is to me the prime question: the missing Sephiroth. First and for all, Daath should be included in the Tree of Life. The cabbalists always stress that the Sephiroth work in pairs (one each on the + and – pillar) producing a third one on the middle pillar that represents the equilibrium of its two ‘parent’ Sephiroth. When Daath is mentioned it is the ‘child’ of Chochmah and Binah. 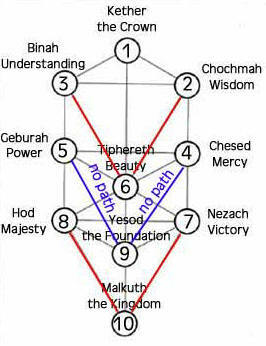 Tiphereth is the result of Chesed and Geburah, Yesod is the result of Hod and Netzah. But what is Malkuth the child of? In the traditional Tree of Life, it kind of dangles at the end of the Tree, not being the result of polar opposites. If there is a place in the universe where polar opposites play a prominent role, it is the physical world. 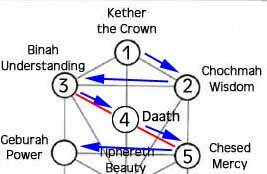 Malkuth, like Yesod, Tiphereth and Daath must be the result of two ‘parent’ Sephiroth, and there is indeed a place for them. In Nature we find symmetry everywhere. Symmetry creates balance and harmony. The original person who came up with the Tree of Life might not have seen the entire picture. In my opinion the traditional Tree of Life does not feel harmonious, complete nor coherent. As we will progress further into our study we will see that the underlying structure is completely symmetrical. 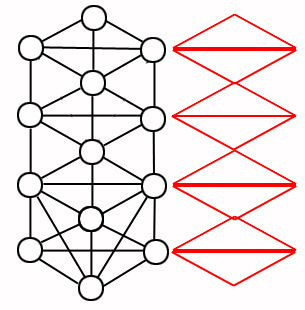 So for now we draw the Tree of Life as a symmetrical structure. In regards to the triads. Traditionally a triad is explained as the balancing of two Sephiroth into a lower third one. Thus a triad is a downward pointing triangle. I think that one can equally say that the balancing goes both upward and downwards. Basically the middle pillar is balanced by the left and right pillar. By extension, the entire tree (in its complete symmetrical form) balances itself in all directions, because everything is symmetrical.